Dusshera, also known as Dashain in Nepal, Dussehra in Punjab, Golu in Tamil Nadu and Vijayadashami in other parts of South India, is one of the most popular Hindu festivals in South-East Asia. Derived from the Sanskrit words ‘Dus’ and ‘Hara’, it literally means ‘defeat of the ten’, referring to the defeat of the ten-headed Ravana by Rama. Many consider this festival a true representative of the multicultural Indian society, since it is celebrated in almost every part of India but in different ways, with different stories, rituals and festivities attached to it. Dusshera typically falls in the months of September or October, marking the end of the hot summer and/or monsoon season and ushering in the cooler weather. It is essentially a celebration of the victory of good over evil and virtue over sin, as represented by the defeat of Ravana by Lord Rama. Dusshera has been celebrated in the Hindu culture for many centuries, though the religious significance varies based on the region. In north India, Dusshera marks the tenth day of the epic battle between Rama and Ravana, the day when Rama defeated Ravana and won the war. The festivities here start a few days before Dusshera itself and usually involve the staging of Ram-Leela, an elaborately costumed drama that re-enacts scenes from the Ramayana, a scared Hindu religious text, for the community. 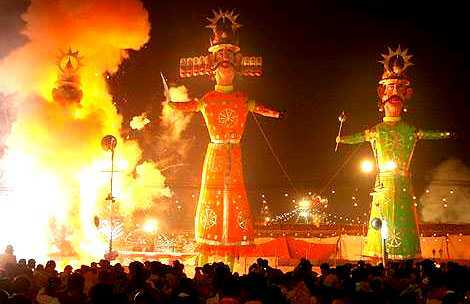 Additionally, on the tenth and final day, effigies of Ravana, as well as other villainous figures from Ramayana, are constructed, paraded and finally burnt. In Bengal, Dusshera marks the culmination of the all-important Durga Utsav, a worshipping of Durga and her triumph over the evil Mahishasur. In Gujarat, Dusshera comes at the end of the nine day festival of Navratri, marked by daily celebrations involving the famous ‘Garba’ and ‘Dandiya’ dances. Known as Vijayadashami in Tamil Nadu and Dasara in Karnataka, this festival is largely a celebration of different female goddesses. Mysore Dasara is celebrated mainly in Karnataka, which is also a culmination of a ten-day festival celebrating the defeat of a mighty asura (demon) at the hand of the goddess Chamundeshwari. As with any festival in India, the clothing and ornamentation forms a crucial part of the celebrations and is largely determined by the rituals being performed and mythology being celebrated. In most places, wearing new clothes on the day of Dusshera is an absolute must, with ethnic clothes like sarees, salwar kameez, lehenga cholis, kurta pajamas and sherwanis being the most appropriate choice. Moreover, since the festival celebrates the triumph of good over evil, the color scheme tends to be bright and vibrant, with a lot of dazzling embroidery and embellishments used to display the festive spirit. At Dusshera, like at any Hindu festival, pomp and splendor of celebration extends to the clothing and accessories of the celebrants as well. Though every region has their own variation certain common elements include a heavy and richly decorated Indian garment (be it a saree, lehenga choli or sherwani) and ethnic jewelry like mang tikkas, anklets and bangles, in addition to necklaces and earrings. Gold, considered the metal of the gods In India, is the most appropriate metal for this day. Often garlands of fresh flowers are worn in the hair. 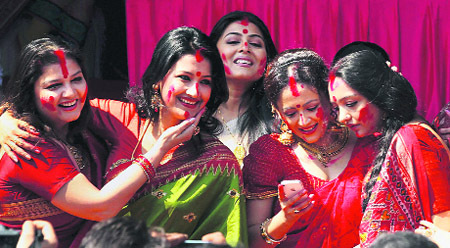 For women the make-up is also distinctive, especially in the areas where Dusshera is celebrated as day of goddess worship; for instance, in Bengal women are expected to have the large red bindi on their forehead along with thick kohl on their eyes. Every region in the country has different rituals and ceremonies during Dusshera and this extends to the dressing scheme as well. In the North, detailed, bold and colorful costumes are donned by the actors staging the Ram-Leela while those celebrating the festival would be seen in traditional clothes like salwar kameez and sarees, in bright festive shades of red, yellow, green, blue, pink and purple. Men also dress up in traditional clothes, such as kurtas and sherwanis. Often clothes with intricate embroidery and embellishments like zari and gota patti are freshly purchased for this day and worn along with heavy jewelry. Durga Pooja is the main festival of Hindus in Bengal and hence it is celebrated with a lot of pomp and splendor. For all nine days of the festival, beautiful festive sarees are donned by the women while the men wear rich sherwanis. The most traditional and exquisite clothing items are reserved for Dusshera; for women, the Indian saree draped in the typical Bengali style is a must while for men, sherwanis, Jodhpuri suits and other classic Indian styles are preferred. For both the combination of red and white is essential as this is a very auspicious color combination for Bengalis that gains even more significance during Dusshera. Married women specifically are expected to don bright red sarees and gold jewelry. 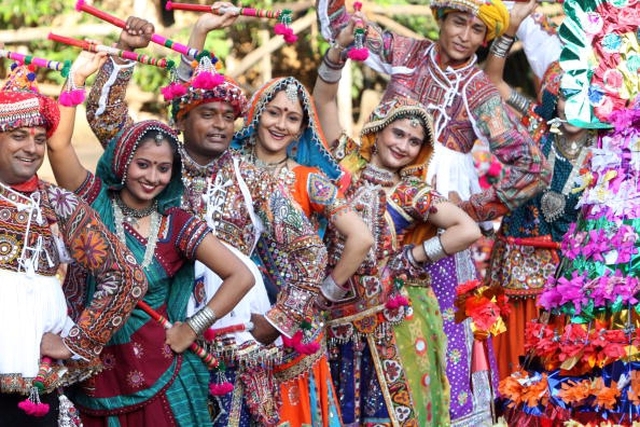 Navratri in Gujarat is one of the most colorful festivals in India and during Navratri as well as Dusshera women dress up in distinctive regional outfits with a lot of vibrant colors and embellishments. The ghagra choli is the preferred outfit for the dandiya and garba dances, with the wide, circular fall of the skirt making it perfect for the elaborate twirls and in-steps taken during the dance. The most traditional ones come with a lot mirror work, patch border designs and colorful embroidery. These are usually made of materials like cotton to make them comfortable for dancing. On each day of Navratri, a different ‘color’ is considered the most auspicious. On the final day, i.e., Dusshera, the most elaborately designed and heavy outfit is worn. In terms of jewelry thick white and red bangles, armlets, rings and metallic anklets are used to complete the outfit. In both Tamil Nadu and Karnataka, silk sarees are the preferred outfits for Dusshera. Women bring out their finest Kanjeevaram or Mysore silk sarees with thick gold borders. Here, too, bright colors are the norm, along with detailed gold work, zari weaves and temple borders. Menswear on the other hand is usually white or off-white dhoti kurtas with heavy, colorful and richly decorated scarves called angavastrams. These are often made of heavy silks with metallic borders. Nowadays it is not uncommon to see more cosmopolitan, modern ethnic fashions for a festival like Dusshera. Many women like to experiment within the set boundaries: though they might still wear a red and white saree, they will go for a more innovative cut or new type of fabric like net or velvet. Some of the more trendy ethnic garments which can be seen at Dusshera celebrations around the country include lehenga cholis with heavy stone work and sequins designs, printed silk sarees, anarkali salwar kameez and Nehru suits. It is commonly believed that if you wear a new set of clothes on Dusshera, you will get ten new sets of clothes in the year ahead. Women take centre stage during this festival and many of the beliefs surrounding Dusshera celebrate the power of female deities. The festival is often associated with the veneration of knowledge and skills and in fact in South India, children start their first day of kindergarten at the end of the festival.